The field of customer service is a rich and complex area. Although in the past there was a linear theory, now, in present times, we can only talk about some common points that all businesses respect while they create their own theory of client service. Even so, we have to take a brief look at the most discussed theories of customer service because they make the difference between good practice and bad practice. But beyond just good practice, these theories help us create the right practice in our client service. 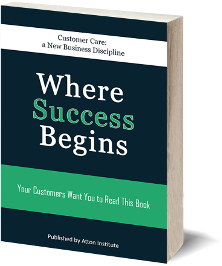 Good practice in customer service is a temporary success for one client; bad practice is the failure to satisfy clients; but the right practice is about creating a self-sustained behavior within the management level of the company. The right practice influences positive behavior in employees at every level and succeeds in winning more loyal customers for a business. Most theories focus on what satisfies the consumers. These theories talk about a psychological state of the client that is caused by the interaction between the client and the company. This psychological state is called “satisfaction.” However, customer satisfaction is not based only on what the company offers, but also on the personal expectations of the consumer, including likes and dislikes and the probability of a beneficial result; this means that customers can predict whether they are going to be pleased with their interactions with the company according to their values. Since most theories on client service pay close attention to satisfaction (defined as meeting expectations), we have to understand how the theory of satisfaction has influenced companies over time. Customer service based on satisfaction has had a direct impact on employees and managers alike. In modern day practice, companies often still struggle to please their clients. We have to mention the fact that client expectation is very subjective, and therefore it can be irrational or imprecise; this leads to a high probability that it won’t be fulfilled or measured. For example, if a consumer buys a loaf of bread, he might not have a defined expectation about the product because it is a commonly produced and consumed item. However, after making the purchase, the buyer goes home and discovers that the bread doesn’t taste the same as the one he bought before. He starts to define his expectation only after the purchase – that bread should be freshly baked, clean, should taste good and especially be worthy of the money he spent on it. In this case, the customer is dissatisfied based on the expectations he created after the purchase, and he might not return to the store. When we are talking about the value of a product, we mean the balance between price and quality. The price must be equal to the expected quality. Low price means low quality; high price means high quality – that is the theoretical equation. However, in practice, there are many cases such as low price-good quality and high price-low quality, and unfortunately these drive the customers off. Returning to the example of bread, consumers would pay a relative low price for a simple loaf of bread made of yeast, water, salt, flour and probably some additives to keep it from expiring in a day or two. If the bread contains banana, potato, mushrooms or other interesting mixes, clients expect to pay a higher price. They can see the difference between basic bread and fancy bread. On the other hand, in the case of items that we cannot easily differentiate, such as ocean breeze soap versus flower soap, the buyer can be easily dissatisfied by the price-quality ratio of the item; this happens because he expects the ocean breeze soap to smell like the ocean and the flower soap to smell like flowers. We know that the scent of the ocean cannot be easily fabricated. It is risky to sell such items because customer expectations are highly subjective. While one person might imagine the ocean as a summer beach with music and the smell of barbecue, someone else might imagine it as a powerful storm with no smell. Whose expectations will the ocean breeze soap satisfy? The answer is most likely no one’s.